The calamity that occurred in Japan last Friday sparked the attention about the safety of the Philippines about earthquakes and tsunamis. PHIVOLCS and the government assured that the new high-rise buildings around Metro Manila are sound enough to withstand earthquakes. However, many people are still concerned, especially because of the many fault lines around our country. For those who are looking for a map issued by PHIVOLCS that shows the major fault lines, I suggest that you visit this PHIVOLCS page (PDF document). 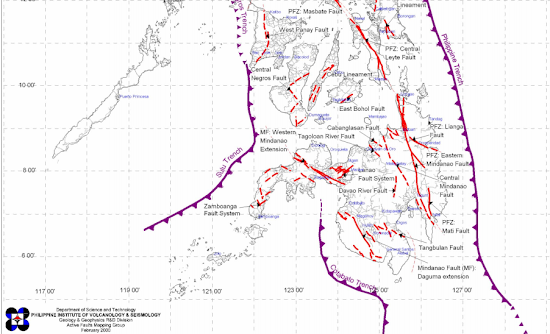 The map shows the distribution of active faults and trenches in the Philippines as delineated by PHIVOLCS. The picture below shows the preview of that map from PHIVOLCS. The PDF file from PHIVOLCS is much clearer so I suggest that you should look at it. To see the regional distribution of fault lines in the Philippines, I suggest that you visit this PHIVOLCS page. Be prepared for earthquakes and the best preparation is to gain knowledge. 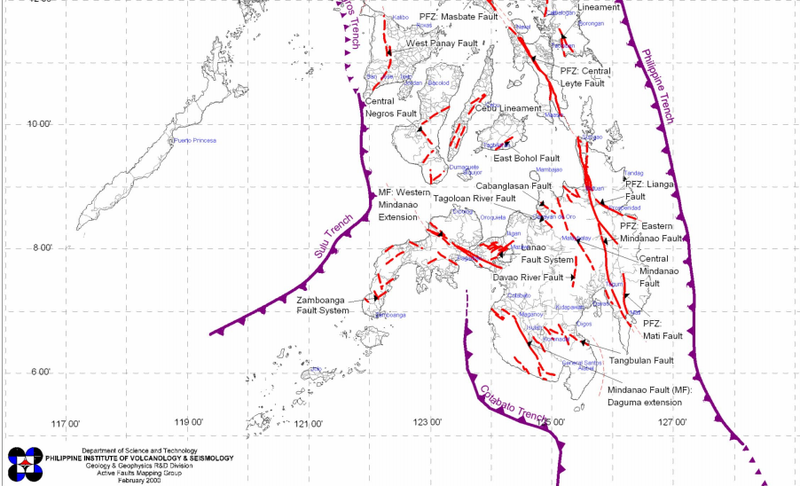 Visit my posts about PHIVOLCS Tips on what to do before, during and after an earthquake, PHIVOLCS Map of Tsunami Prone Areas, and PHIVOLCS Maps of areas affected by Marikina Fault. Do you need information about PHIVOLCS? Do you have questions regarding earthquakes and fault line maps? Please tell us by leaving a comment. super labo ng map. I hope Phivolcs have a clearer map. Large scale ang maps diyan at naka-ayos per region. ang liit naman ng map.pano ko po makita kung my active foult sa lugar namin? That link goes directly to the maps of Phivolcs. I am sure may malalaki at malinaw na mapa sila doon. As I had said previously, visit the website of PHIVOLCS to see the clear copy of the fault line map. I just wanna ask a map of the active fault lines in Guihulngan City Negros oriental, I hope Philvocs can provide for us to check if we are near or far from the fault lines. I just wanna ask a map of the active fault lines in Bulacan, ASAP , para lang po sa thesis namin.. maraming salamat po.. It will take you to PHIVOLCS webpage that shows the map of fault lines in the Philippines. The link leads you to Map of Region III that shows the active fault of that region, which includes Bulacan Province. WE DO THIS TO PERFORM TIME-HISTORY ANALYSIS OF STRUCTURES. I don't have those documents. I suggest that you contact PHIVOLCS so they can help you with your concern. hi...ask ko lang po about doon sa interview sa tv patrol news tungkol sa possible earthquake this feb.22,2013 i don't remember po kc the exact date nong news pero naglagay kc ako ng reminder alarm sa calendar ng phone ko about sa napanood ko nga sa news na magready kc nga possible na mag-ka earthquake sa manila and maraming buildings ang masisira kc mahina ang mga pagkakagawa...totoo po ba un??? knina p po kc ako naghahanap nong news na napanood ko b4 na news di ko na makita.. help me pls kung tama nga po ba ako? Ano po yung ibig ninyong sabihin sa Feb 22 earthquake? May nag-predict po ba na may lindol nangyari noong Feb 22? Tungkol naman po sa tanong ninyo, malungkot pong sabihin pero totoo po yung nasa balita. Maraming mga lumang gusali ang tiyak na bibigay kapag lumindol sa Marikina Fault Line. Kung nakatira kayo sa Metro Manila ay tingnan po ninyo kung yung bahay ninyo ay malapit sa isang fault line. Tapos tingnan ninyo kung matibay pagkagawa ng bahay ninyo. I wanted to know the exact location of a fault line here in Talisay City, Cebu as I lived here in Talisay and there's a 7.2 quake here yeterday. thanks. Hi, May i ask po, ang Forest Hill/Sun Vally subdivision in Antipolo, malapit po ba sya sa fault line? Thanks. Hi! Just wanna ask, meron po bang fault line na near sa Baguio? Base sa mapa ng PHIVOLCS ay walang fault line sa mismong Baguio City. Kaso may fault lines sa paligid ng Baguio. Punta po kayo sa website ng PHIVOLCS para makita ninyo ang large-scale na mapa ng mga fault lines. Hello, Ishmael. Thank you for your post. And I want to point out how patiently you answered each comment reminding them of your suggestion to open the PDF and visit the PHIVOLCS site for more information. It's funny they'd leave these comments when they haven't read your post. Halatang hindi nagnabasa. Hi, I want to see or know the specific areas of active west valley fault of Pasong Putik Proper Quezon City. Please. Thank you very much for visiting my blog. It's no problem for me repeating my comments. I'm here to help. Pwede po ba namin makita ang specific na lugar o barangay kung saan andoon ang active fault line sa mapa ng san fernando city, la union? Meron kasi kaming mga barangays kung saan ay may parte na parang lumulubog po. I suggest that you check the maps in PHIVOLCS website. Can i have a link for the fault lines in metro manila please? Thanks so much!